MYITKYINA - The Battle of Bhamo appeared this week to have turned into a siege. North of the Irrawaddy River port, the enemy had given ground since the Allies' October 15 push-off without the fanatical resistance chartacterizing earlier defense of his North Burma holdings. But when the Chinese troops commanded by lt. Gen. Dan I. Sultan wrapped their tentacles around Bhamo, they found the enemy dug in deeply, possibly in a mood to resist to the bitter end. How long it will take to flush the Japs out of Bhamo no one will officially predict. Necessarily, it will depend upon earlier-decided strategy. Lt. Gen. Sun Li-jen, commander of the Chinese 1st Army, whose 38th Division is bearing the brunt of the offense, hinted the attackers might not be in a hurry to capture Bhamo. The Allies, he declared, might prefer to make the Japs fight on their own terms, rather than on conditions favoring the enemy. Early in the week, Chinese troops, advancing behind air and artillery support, approached the rim of Bhamo defenses in two places - from the southeast along the Bhamo-Namkham Road and from the east along the Bhamo-Momauk Road - and drove another wedge toward the encircled town from the north. As a result of subsequent Chinese operations, the present lines are now pressed against the main Jap defenses along the south border of Bhamo and then northeast to the southern end of the airstrip, along the east side of the airstrip, and then northwest to the Irrawaddy River, about one and a half miles north of the bazaar area. The bazaar area is in the center of the town, near the river. One day, the Chinese, advancing behind American dive-bombers, took four Jap strongpoints in heavy fighting. Bombs plummeted into enemy positions only 100 yards from the attacking Chinese, who reported they could see Jap arms and legs fly into the air. At week's start, the all-British 36th Division, moving south down the railroad corridor above Pinwe, were forced to make a slight withdrawal. Later, however, they returned to the offensive (attacking frontally due to extremely dense jungle east and west of the corridor) and took primary objectives against stubborn resistance from apparently fresh Japanese troops. Fifty Japs were killed one day by members of a Welsh unit after a fierce road block skirmish. Strong patrol actions by the 36th are now continuing. INDIA - Tokyo, "brain" of the Japanese octopus, was still belching flame and smoke from Friday's Super-Fortress raid when it was announced that the long-range B-29's of the newly formed 21st Bomber Command, operating from Saipan in the Marianas, were led by Brig. Gen. Emmett (Rosie) O'Donnell, former CBI-lander. It was sweet revenge for the 38 year old General from Brooklyn, who was on the receiving end from the Japs in the Phillipines in 1942 before he went on the offensive as a member of the embryo 10th Air Force in India. O'Donnell's men, in a force described as "sizeable," swept out of the sky Friday at noon, Tokyo time, after a 1500-mile flight from Saipan, wrested from the Japs five months ago after a bitter fight. Ack-ack fire was moderate. Fighter opposition was slight. The B-29's struck at the great Musashino Aircraft Plant, in the northwest section of the city, as well as other selected industrial targets, including hydo-electric plants, dams and shipyards. Repair docks at Yokohama were also reported mauled. The first formations over the enemy capital had clear weather and did a good job, but later planes ran into a thick cloud cover that minimized their results. According to reports, crews taking part in the raid were specially briefed to avoid hitting the Emperor's Palace grounds and shrines. Silent momentarily about the second air assault upon the Japanese capital - Lt. Gen. Jimmy Doolittle's Hornet-based B-25's paid the original visit on April 18, 1942 - Tokyo radio admitted the raid four hours later, stating it covered a two-hour period and "damaged factories and other important installations." While the mission was personally led by O'Donnell, a former West Point football coach, the overall mission was directed by Brig. Gen. Haywood S. Hansell, Jr., Commanding General of the 21st Bomber Command. Thus, officially, was opened the two-pronged air war against the Japanese inner fortress. China-based 20th Bomber Command Super-Forts of General Hap Arnold's global air force have been regularly striking at such targets as Omura, Nagasaki and Kyushu for six months. The price paid for setting Tokyo ablaze Friday is tentatively reported as two planes and one crew. The entire crew of one Super-Fort was picked up by a destroyer after spending 19½ hours in the water on a liferaft. In a special report to the president, Arnold declared, "The battle for Japan has been joined. The systematic destruction of Japan's war production was begun six months ago from China bases. Henceforth, it will be carried out with decisive vigor, softening up the Japanese heart for ultimate invasion." New Raids - As the Roundup was going to press, two new, simultaneous B-29 raids were announced. One strike was directed at Tokyo by the 21st Bomber Command operating from the Marianas. The other was India-based by the 20th Bomber Command against Bangkok in Thailand. No planes were lost in combat in either raid. INDIA - How a C-54 mercy plane made a near record-breaking, 57-hour flight from India to Washington with critically injured Brig. Gen. Laverne G. (Blondy) Saunders, 20th Bomber Command officer, was disclosed this week in a delayed dispatch by the War Department. It was also the first official announcement that Saunders suffered compound fractures of both legs and his right arm when he crashed Sept. 17, while on an administrative flight. Infection, which set in when he lay eight hours in the jungle awaiting help, made a quick return to the United States a medical necessity. The plane, carrtying 10 other passengers made five halts to check the General's condition, refuel and put on new crews. Saunders is now being treated in Walter Reed Hospital. CHINA - China-based B-29's of Maj. Gen. Curtis LeMay's 20th Bomber Command returned to the attack this week on the Omura aircraft factory on Kyushu Island in Japan, blasting the Nip works in a daylight operation that required bombing by instrument because of overcast. 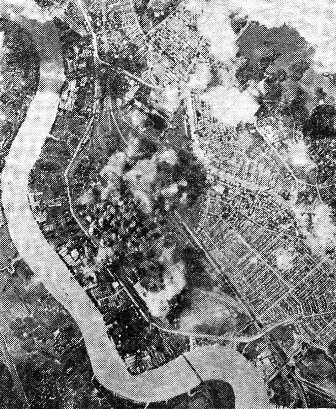 The weather caused diversion of part of the mission and some of the planes hit military storage areas at Shanghai and others bombed the docks at Nanking. At least two direct hits were obtained on the warehouses at Nanking. Nanking results were reported as good and Shanghai results as fair to good. The air giants ran into their toughest fighter opposition to date. Jap fighter strength was described as formidable. The B-29's reported destroying 20 Nip planes, with 16 probables and 19 others damaged. Two B-29's were lost to the Jap fighters, the first plane of this type ever to fall victim to enemy air action. One other Super-Fort is also reported missing and presumed lost in the engagement. CHINA - Japanese armies which have linked up Nippon's holdings in North and South China found themselves holding a hot potato this week as the 14th Air Force bombed and shot-up enemy held installations from Kwangsi Province north to the Yellow River and south to Hainan Island. The enemy navy also felt the striking power of the 14th. A single B-24 damaged two light cruisers Saturday night, scoring two direct hits on one of them, in an attack on a South China Sea convoy. Another B-24 reported sinking a sub chaser in the same area. P-51's hammered at targets on the Ishan-Liuchow front along the Kwangsi-Kweichow railroad, over which Jap units are moving north-westward in force, while other Mustangs struck at the enemy's rear areas, sinking six Jap freighters in the Yangtze River and two in Amoy harbor, besides destroying 11 locomotives at Taiyuan on the Yellow River. 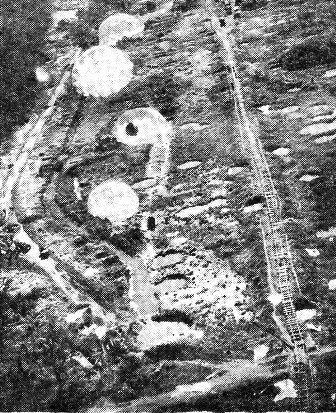 Nip airdromes at Kiukiang, Anking, Hengyang, Liuchow and Paoching were raked, to compile a total of 16 Jap aircraft destroyed, three probably destroyed and 22 damaged on the ground or in fierce air battles. B-24's exploded and sank a large enemy ship in a convoy east of Shanghai and probably sank two others in the convoy. The Liberators also bombed Yochow twice and Samah Bay installations three times during the week, besides attacks on the Kowloon docks at Hongkong and two raids on Hankow. Numerous fighter missions supported Chinese Salween front troops, hitting Chefang and Wanling. P-38's knocked out two bridges at Mongyu and Kaunghka, while B-25's attacked Lashio warehouses and Hsenwi. CHUNGKING (ANS) - As Japanese troops from Hengyang and Canton joined forces in fallen Liuchow this week, thus severing China in two and giving the enemy a supply line from Manchuria to Hong-Kong, Maj. Gen. A. C. Wedemeyer, commander of U.S. Forces in the China Theater, announced that Chiang Kai-shek had accepted the general concept of his plan for disposing Chinese forces to meet the enemy threat. Wedemeyer said the plan is now going into effect. He told a press conference that possible enemy moves included a push from captured Liuchow to Kwangsai Province south for a linkup with the enemy forces in French Indo-China. The China Theater commander also revealed that his command would automatically embrace any American seaborne forces landed in China. In response to a query whether American forces would be brought over The Hump from India to China, he declared only that he "visualized employment of all kinds of resources from all directions." Wedemeyer made no attempt to take an optimistic view of the situation which finds strong Jap forces now in a position for further inroads on Nationalist China. But, he reiterated his belief that the Chinese-American position is far from hopeless, saying, "I still have the feeling that our problems are not insurmountable." He stated that the enemy is "terribly concerned" over his position. Although Wedemeyer did not amplify his latter remark, a spokeman for the Chinese High Command asserted the Japs would be unable to launch another offensive for another two or three months due to over-extended supply lines. Meanwhile, the 14th Air Force announced its base at Nanning had been abandoned and destroyed, due to threat of Jap ground attacks, on Nov. 19. This was the seventh 14th base to be lost to the enemy offensive. Hengyang, Lingling, Kweilin, Liuchow, Paoching and Tanchuk being others. 10TH AIR FOCE HQ., BURMA - You generally associate pin-point bombing with fighter and bomber planes. But then you're not giving a fair shake to the gang who fly the 10th Air Force's Troop Carrier and Combat Cargo planes, who have a remarkable record for accuracy in supply dropping. Battle lines in Burma have been so fluid at times that the pilots' instructions were out of date an hour after take-off. In many cases, they had to be briefed on new targets while in the air. But so fine has been their marksmanship, that seldon, if ever, have they 'chuted a package to the wrong team in the jungle warfare. Less than two hours before the picture at left was taken, the territory was in Jap hands. While the pilot was in the air, he was ordered to this point. Advance Allied patrols, left center, wait to pick up the packages. NEW YORK (ANS) - Clarence E. Gauss, who resigned recently as ambassador to China, arrived in New York this week aboard an ATC plane from Africa. Gauss said he would remain in New York overnight, then proceed to Washington, D.C. A fellow passenger was Dr. Chun J. Pao, Chinese ambassador to Peru. An OWI news flash says Maj. Gen. Patrick Hurley is the new ambassador to China. WASHINGTON (AP) - Armed Forces casualties as of November 7, 1944, total 528,795, including 117,453 dead, Secretary of War Henry Stimson said this week, with Army casualties comprising 454,180 of the number. CHUNGKING - China Theater troops of the American-trained Chinese forces of the Salween Expeditionary group accompanied by the American liaison group of Brig. Gen Frank Dorn, continued their advance down the Mangshih Valley this week after capturing Mangshih City on Nov. 19. A frontal assault down the Burma Road, with a simultaneous double envelopement of the city's defenses, forced the Japs to evacuate at 11 p.m. Chinese forces immediately moved in under cover of darkness, marking the third major Nip stronghold on the Salween Front to fall since the offensive started. Tengchung and Lungling were previously lost by the enemy. As the attack on Mangshih began, the Japs, recognizing the power of the assault, burned the stores in the city and the adjacent rice paddies. The enemy fortifications in the city were among the strongest yet encountered in the campaign, with heavily-reinforced air shelters and pill boxes. Repair work on the Mangshih Airfield began immediately and U.S. Engineers of Dorn's command began to clear the city of the many mines and booby traps discovered there. Part of the retreating Japs withdrew through Mengka, 10 miles east of Chefang where the pursuing Chinese caight them with another three-pronged attack which captured Mengka on Nov. 24, remnants of the Jap garrison retreating south. Another body of Jap troops retreating from Mangshih was cornered on the high ground north of Hpate, nine miles southwest of Mangshih on the Burma Road, where a Chinese attack on Nov.24 completely occupied the peak position of Nantsoshi. The last enemy resistance from the mountainous passes dividing the Mangshih and Chefang Valleys has been eliminated and only minor natural obstacles remain between the Chinese forces and Chefang. From the east, the Chinese are only five miles from the city. The 14th Air Force has rendered effective and timely support to the ground advance, flying over 100 sorties against the Nips in Chefang-Wanling area during the two days of the 23-24 November drive alone. Considerable damage was also done to Mangshih by attacks of both the 14th and 10th Air Forces previous to the capture of the city. CHUNGKING - Two WAC's, members of Maj. Gen. A. C. Wedemeyer's staff, reached the never-never land of China this week, strengthening the tiny contingent of Army nurses and Red Cross girls already serving on the far side of The Hump. Wedemeyer declared: "I visualize bringing in more WAC's, nurses and Red Cross members. It will be done gradually, of course, and the women will relieve men now employed on secretarial and other posts." The new commander of U.S. troops in China explained: "In my opinion it will improve the morale of the men." NORTH BURMA - Accompanied by Lt. Gen Dan I. Sultan, an important visitor inspected the Allied North Burma battlefront this week and declared that he was impressed by the enthusiasm, energy and toughness of the jungle fighting men he had seen. The visitor: Gen. Sir Oliver Leese, newly-appointed C-in-C, Allied Land Forces, Southeast Asia, former commander of the colorful, rugged Eighth Army in Italy. Leese flew to the most forward airstrip south of Myitkyina. Only a few hundred yards from Jap positions, he decorated officers and men of the 36th Division, in addition to presenting a DSO to Col. Trevor N. Dupuy, American liaison officer with a Chinese artillery group. He spent several fruitful hours with Chinese and American troops. In the photo, Lt. Gen. Dan I. Sultan, right, explains the progress of the North Burma campaign to Lt. Gen. Sir Oliver Leese, center, C-in-C, Southeast Asia Land Forces. 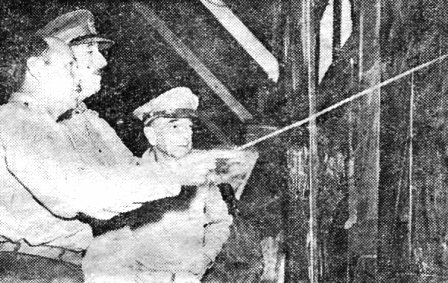 Left, Col. Thomas H. Davies, Sultan's Chief of Operations, points out explanation of the action. BURMA - Ferrying supplies into camp on an improvised raft of empty gasoline drums was never taught at Camp Claiborne to the SOS Engineers who operate the CBI Pipeline. Nor was the proper way to manage a rubber life boat a part of their Field Manuals. And certainly, checking for leaks in the pipeline daily in an assault boat was not prescribed as SOP. All three of these amphibious operaions, however, comprise normal "daily dozens" for certain members of the Engineer Petroleum Distribution Companies under Engineer Division No.1. With the roads washed out and almost surrounded by water, the men of one pumping station devised a raft, using four empty 55-gallon gasoline drums lashed together. Propelled by bamboo poles, this craft crooses the "River Styx," as the body of water has been locally nicknamed, several times daily to bring in supplies. Farther along the line lies "Twin Islands," another pumping station. The station itself is on "Island Number One," while on "Island Number Two" a mile or more away live the men. An assault boat, powered by a 22 horsepower Johnson outboard motor, plies back and forth between the islands, carrying tools and equipment and the men who work at the pumps. This detachment of men is the proud possessor of a second boat in their boathouse, this one being an inflated rubber one of the type carried in aircraft for emergency use! It is a "personnel carrier" only, and serves as a ferry between the home island and nearby solid ground. Another assault boat with an outboard motor is used at one point to make the daily pipeline patrol for leaks. As gasoline is easily detected on the surface of the water a leak is quickly spotted. This group of men is the envy of all the pipeline walkers who walk many weary miles a day looking for leaks. 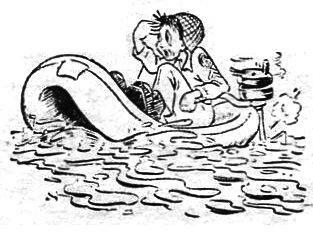 These "Amphibious Pipeliners" are seriously considering designing a shoulder patch of their own, complete with rampant motorboats, crossed bamboo poles, and quartered gasoline drums. RAMGARH, INDIA - Mighty nimrods, these. Maj. A. V. Larson and Capt. 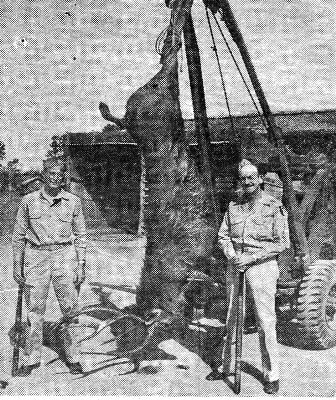 J. J. Hicks brought down this 600-pound Samba in the vicinity of the Ramgarh Training Center. The guns of both hunters roared simultaneously. Each scored a hit. Whose shot had killed the Samba? It was a situation which cried desperately for the diplomatic skill of Roosevelt-Churchill caliber. To their credit, Larson and Hicks rose nobly to the crisis. As a compromise, larson got the head and antlers as a mantlepiece; Mrs. Hicks will soon have a deerskin rug to display to friends. And the Ramgarh Training Center's Officer's Mess enjoyed a meal to titillate the palate of an epicure. Fair enough. MYITKYINA - Shows like that of the Jinx Falkenburg - Pat O'Brien troupe are few and far between in these woods, so men of an Engineer unit stationed south of the big river here weren't going to miss the USO gang's recent performance at this base. With no ferry service after dark, however, it looked for a time as if the jungle-bound lads would have to swim it or look for a narrow place to jump across the stream, neither one a likely proposition. So they proceeded to load up some of the outfit's own boats, disassembled, on trucks, and hauled them down to the river bank, where the vessels were quickly put together and utilized for river-crossing purposes. Returning after the show was over, they re-crossed the river, again broke down the boats, loaded them on the trucks and portaged back to camp. All that to see a show, but the boys agree it was worth the trip. BURMA - Capt. Walter P. Allen, 25, of Route 3, Terrell, Tex., isn't superstitious, but his crew is wondering whether he hasn't run across an omen. A B-25 pilot with the 490th Medium Bombardment Squadron, 10th Air Force, he chalked up 48 missions and 350 combat hours in his first full year - a year that saw him and his plane come out unscathed after every job. But! In his first two missions of his second year, his plane was hit by ack-ack fire, and each time one member of his crew came up with a Purple Heart. The last time out the crew counted 35 holes after it came back from a mission over Burma. ASSAM, INDIA - Gobs go where battleships fear to tread; so up in Assam, where the only water is the muddy Brahmaputra, The U.S. Navy operates perhaps the best-equipped oxygen plant in the valley. Under the direction of Ensign Franson, the lovers of salt air put out an excellent salt-free variety of avator's breathing oxygen. This oxygen is then given to the Northern Air Service Area Command. The NASAC lads see to it that flyers going over the high, rugged Hump have something to inhale on their way to China. This example of brotherly love has been going on for some time. The plant, built by the Navy, was constructed in record time. The ensign's crew is one of many oxygen crews trained by the Navy in the States and then dispatched with full equipment to various sections of the globe. All chemicals and supplies for this plant come from Navy stores; all output of the plant goes to the Air Forces. Looks as if the sailors are just trying to prove that the Irving berlin song was right, "an Army show could never be a hit without the Navy." NEW DELHI - The fair femmes who wear the uniform of the U.S. Army Nurse Corps have for the first time, a Director in the India-Burma Theater. She is Lt. Col. Agnes Maley, 14 years in the Regular Army, and a native of Garber, Okla.
We met Lt. Col. Maley just after her arrival in this theater, interviewing her at her office in New Delhi. A warmly human individual, clad in the new summer olive drab uniform of the Army Nurse Corps, she explained her duties in a pleasant, informal manner. Despite the fact that the Director is a lieutenant colonel, she is not rank concious. Her first concern was for the dress of the nurses over here. Not in the sense of making every nurse have eight pleats in each skirt, but in the sense that she wants to see the girls have proper uniforms in proportion to the reputation the Army Nurse Corps has built up. She explained that one of the first things that had struck her when arriving here was the variety of uniforms that she had observed nurses wearing. But she also hastened to explain that it was not the fault of the nurses, since many came here two years ago with three kinds of uniforms and haven't had anything else available. 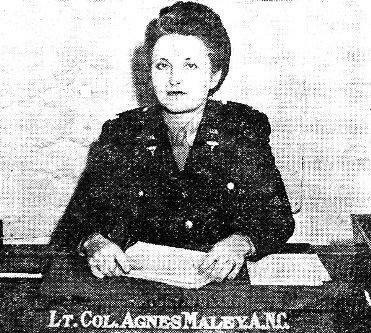 Lt. Col. Maley said she will work with the Quartermaster Department and try to see if she cannot get available for all nurses in the Theater a seer-sucker uniform for duty; the olive drab tropical worsted for summer wear; and the olive drab wool for winter wear. The Director's duties include control of the activities of all nurses in the Theater, including rotation assignments and recommedations for promotions. She is soon leaving on a tour of the Theater and plans to make first hand contact with the nurses through their chief nurses and commanding officers. On rotation - "I want the nurses to know they have not been forgotten and will not be. The same rotation applies to them as it does to the other military personnel in this Theater. We will get the rotation of each individual through as soon as possible. The big difficulty, as the nurses know themselves, is replacements." Promotion - "I know that nurses on foreign duty have complained of not getting the proper promotions when compared with those in the States. The T/O for foreign service has been increased. The promotions will be sent through with the minimum of red tape. cases where girls went overseas for two and a half years as second lieutenants and came home with the same rating have happened. We will do what we can to reduce their number." Lt. Col. Maley's last tour of duty was at Camp Blanding, Fla. But she spent three years in the Philippines, leaving there in December, 1940. Our parting question was about slacks, since we have frequently seen nurses wearing them around the Theater. "I have no objection to them where they are practical," she said. "I do want to see that the nurses all wear one color. I saw about four different colors in one city." We didn't tell her that we know a nurse who boasts having eight pair, all different color, including one pair with green stripes that she wear on St. Patrick's Day. However, she would probably have been amused. As we said before, we believe you will like her. 10TH AIR FORCE HEADQUARTERS, BURMA - "Iron Men in Iron Planes" is the cognomen recently given to the Seventh Bomb Group, 10th Air Force, in recognition of its outstanding record of flying more than 100 combat hours per month in all kinds of weather. With the eager beavers of this B-24 Liberator outfit, flying an average of 100 to 125 hours in 10 to 15 missions each month, monsoon or no, is the rule rather than the exception. The "Iron Men" are not ones to rest on their laurels, however. It isn't a shortage of personnel that forces these men to fly so much and so often. As a matter of fact, they aren't forced to do it. It's a burning desire to carry the air war against the Japs in Burma to new heights, a desire that will play a big part in shortening the war. They fly their regular missions, then volunteer for more. Leader of the pack is Lt. Kenneth G. Whittier with a top of 137 hours one recent month. Close on his heels are Lts. Raymond I. Lang and Richard F. Wollenson with 134 hours each and Lt. Bruce C. Williams, 131 hours. ASC BASE, INDIA - Pfc. Andy Elmore, airplane mechanic here for the past 14 months, was busy at his usual job of uncrating new aircraft the other day when his eye caught the inscription on the cowling of a reconnaissance plane, "Spirit of Lafayette School, Lincoln Park, Michigan. Donated by the pupils to the Army, March 17, 1944." 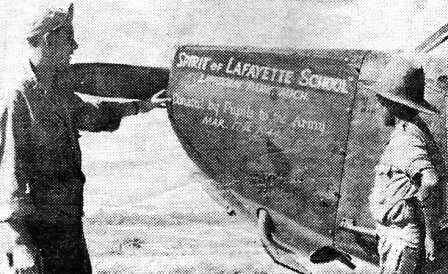 Andy, who graduated from Lafayette himself 10 years ago, quickly removed the rest of the plane's crating and scanned the many signatures of the school's students on the fuselage, finding among them that of his cousin, Elmer Wurster, now at Lafayette. The CO granted Andy permission to make the initial test hop on the "Spirit of Lafayette" when it was finally assembled, and he reported on landing that "she works swell." SALWEEN FRONT (UP) - Chinese troops mopping up among the japanese fortifications on the salween Front, recently captured 10 Japanese and Korean women who had lived with the enemy troops throughout three months of shattering artillery bombardment and desperate close-in fighting that fully reduced Sungshan Mountain. The Japanese had shipped a supply of women to the forward fortresses at Sungshan and other large garrisons on the Salween Front. American liaison officers in action with the Chinese troops were inclined to doubt their own eyes when they first encountered this evidence of Japanese ruthlessness at Tengchung, where they found one Korean girl buried alive in a Japanese ammunition dump as a result of a nearby bomb burst. With the help of a Japanese-speaking Chinese student who had escaped from Manchuria and now is serving with the Americans, the personal story of five of the pathetic women of Sungshan was obtained. Four of them were Korean peasant girls, 24 to 27 years old. They wore Western type cotton dresses they said they's purchased in Singapore. They sat on low stools and eagerly puffed American cigarettes as they gradually relaxed from the shock of months of bomb and shell explosions. They said that early in the spring of 1942 Japanese political officers arrived in their home village, Pingyang, Korea. With propaganda posters and speeches the Japs began a recruitment campaign for "WAC" organizations which they said were to be sent to Singapore to do noncombatant work in rear areas - running rest camps for Japanese troops, entertaining and helping in hospitals. All four said they needed money desperately. One said her father, a farmer, had injured his knee and that for the $1,500 puppet currency (about $12 US), given her when she enlisted, his doctor bills were paid. A party of 18 such girls sailed from Korea in June, 1942. Enroute they said they were fed stories of Japanese victories and of a new empire being created in Southeast Asia. They said they first became worried when they were shipped direct through Singapore and that when they were placed on a train headed north from Rangoon they became certain of their fate. When the party reached Sungshan, on the Salween Front, the four were placed under the charge of a fifth woman - a 35 year old regular Japanese prostitute who also was captured in the mopping up action. There was a total of 24 girls at Sungshan. Among other duties, they had to wash Japanese soldiers' clothing, cook their food and clean out the caves in which they lived. They said they were paid nothing and received no mail from home. When Chinese troops attacked Sungshan, the girls lived below ground in caves. Fourteen of the original 24 were killed by shell-fire. They said they had all been told they would be tortured if captured by the Chinese and all admitted they had believed such stories. They declined to give their correct names to protect their families but all said what they had lived through for the past two years had completely reversed their former naive trust of their Japanese overlords. INDIA-BURMA THEATER - It isn't necessary to be a Private to be a Sad Sack. No less a person than Col. Harry Cooper, I-B Theater Provost Marshall on loan from the U.S. Secret Service, supplied the convincing proof this week. On the occasion of Thanksgiving, Cooper volunteered to purchase cranberry sauce for the 10-man officers' mess of which he is a member between mysterious missions. By a series of lightning mental gymnastics, the eagle colonel calculated that eight cans should be sufficient. "Sufficient" is a monumental understatement. Like a typical Sad Sack character, he neglected to read the label, which stated very plainly: "Dehydrated." 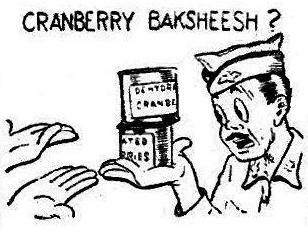 Later in the day, a more observant (and lower ranking) member of the military phoned, coughed delicately and informed the colonel that eight cans of dehydrated cranberry sauce would satisfy the hunger of a battalion of G.I.'s. Thus informed, Col. Harry (Sad Sack) Cooper sneaked back to the salesman to make a readjustment, followed by the low, uncouth jeers of his messmates. Naturally, the salesman refused flatly to "readjust." Original issue of C.B.I. Roundup shared by CBI veteran Howard Sherman.